Kick off your visit on the 12th (Mon): head outdoors with Jetryder and then enjoy the sand and surf at Catseye Beach. To find more things to do, ratings, reviews, and other tourist information, read Hamilton Island trip itinerary planning app . Melbourne to Hamilton Island is an approximately 4.5-hour flight. You can also do a combination of bus, car, and ferry. Traveling from Melbourne in November, expect nights in Hamilton Island to be much warmer, around 26°C, while days are somewhat warmer, around 33°C. Finish up your sightseeing early on the 12th (Mon) so you can catch the ferry to Airlie Beach. Kick off your visit on the 13th (Tue): stop by Beach Book Boutique, go for a walk through Bicentennial Walkway, then soothe aching muscles at some of the top local wellness centers, and finally get interesting insight from Tours. For reviews, ratings, maps, and tourist information, use the Airlie Beach trip builder . Traveling by ferry from Hamilton Island to Airlie Beach takes an hour. In November, plan for daily highs up to 33°C, and evening lows to 27°C. Finish your sightseeing early on the 13th (Tue) so you can travel to Magnetic Island. Kick off your visit on the 14th (Wed): kick back and relax at Geoffrey Bay, explore and take pictures at Magnetic Island Forts Walk, and then tour the water at your own pace with Big Mama Sailing. For traveler tips, maps, ratings, and more tourist information, refer to the Magnetic Island trip itinerary site . Traveling by combination of car and ferry from Airlie Beach to Magnetic Island takes 4.5 hours. Alternatively, you can do a combination of bus and ferry; or do a combination of bus, train, and ferry. In November in Magnetic Island, expect temperatures between 36°C during the day and 26°C at night. Wrap up your sightseeing on the 14th (Wed) to allow time to travel to Cairns. Kick off your visit on the 15th (Thu): meet the residents at Cairns Aquarium and then look for all kinds of wild species at Atherton Tablelands. 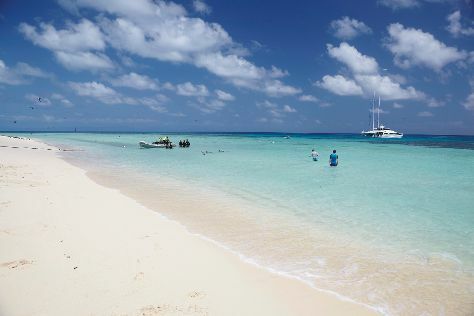 On the 16th (Fri), you'll have a packed day of sightseeing: soothe aching muscles at some of the top local wellness centers and then step off the mainland to explore Michaelmas Cay. For ratings, reviews, traveler tips, and other tourist information, use the Cairns online trip maker . Traveling by combination of ferry and flight from Magnetic Island to Cairns takes 4.5 hours. Alternatively, you can do a combination of ferry and car; or do a combination of ferry and bus. In November, daytime highs in Cairns are 36°C, while nighttime lows are 26°C. Cap off your sightseeing on the 16th (Fri) early enough to travel back home.